Paleo eating has went well today. 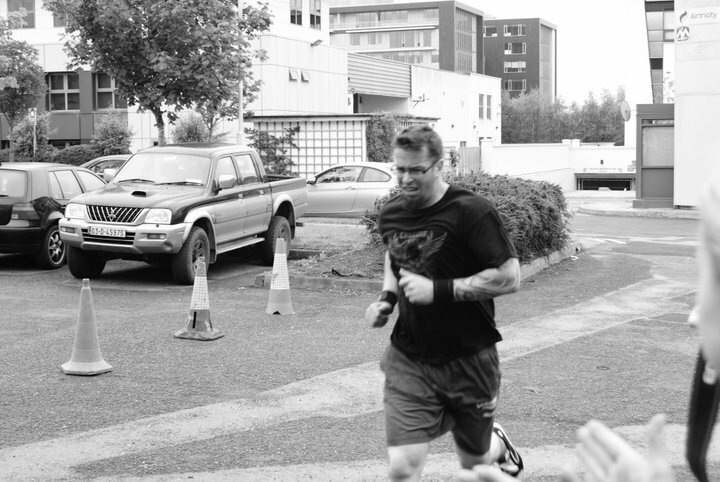 Had a really lazy week after the CrossFit Ireland Invitational with only 1 workout - hill sprints with the vest on. 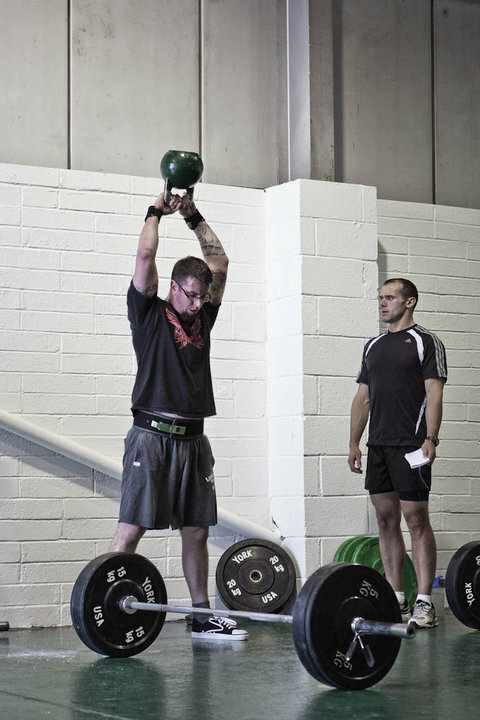 Had my good buddy Karl Steadman at CrossFit 3D doing my metcon programming prior to going to Dublin and felt fantastic when I was there, conditioning was best its been in a long time. So on returning I asked him if he would be interested in doing all my programming - basicly the trip to Ireland has fired up my CrossFit habit again. 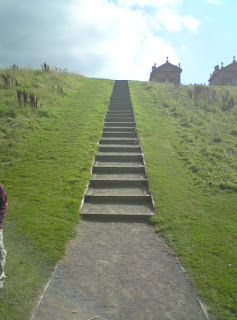 This time however Im not going to sacrifice my hard gained strength, so he will be programming around big lifts. I have had a great year so far with the programming from Jay Ashman using the Jim Wendler 5/3/1 system but think its time for a change. Also I have started a 30 day Paleo challenge that is happening at the affiliate my friend Alison trains at in the states - Hamerdown CrossFit. So from today im trying my best to be dairy/grain/alcohol free for next 30 days. I have set up another blog just to keep track of my eating, but instead of writing it all down I am just going to post a photo of every meal. 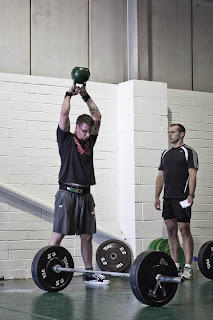 So at the weekend I flew over to Dublin for my 3rd CrossFit Ireland Invitational. the OHS and ring dip workout was the only one that really worried me, but there was no way I could do it with 60kg so scaled back to 50kg. 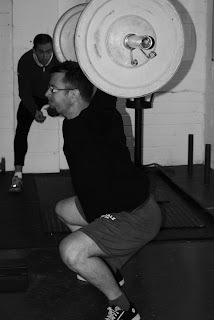 Even with the scale I didnt manage to finish the workout in the time allowed, just could not stabilise the bar overhead. That will teach me to miss out overhead squatting. Lunch was then cosumed, supplied by one of the members who catered for us all - lots of meat, veg, fruit etc and it was superb. I had loads and had a plate put away for after the event. The last event suited me - 60kg squat cleans/ very accurate wall ball / kb swings. 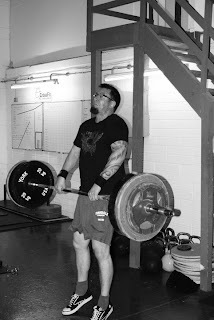 The squat cleans were tough after the other events but were still manageable - think I did first set in a row then split other 2 sets up into 5's. The wall ball was to an iron beam, 10ft from the ground and there were very specific consitions to a rep counting - ball must hit flat surface of the beam, not the underneath, can hit top, must be caught. I didnt miss too many of these - I guess being tall helped. Then onto the KB Swings - easy enough as I really like swings. Had a fantastic weekend, a few Guinness last night and woke up in bits on Sunday morning with shoulders that feel like someone has ran over them in a truck, but no injuries! Back really tight all day and wasnt happy doing these squats. My 400m run is a bit rubbish as I have ro run from the back garden, into the house, back out the front door, up to end of street, turn round then back into the house again and back to the garden.